I’m not sure about you, but I’m obsessed with the sous vide egg bites from Starbucks, so I had to come up with my own sous vide egg bites recipe:) It took a couple tries, but I knew I wanted to use the slow cooker, so I came up with my easy slow cooker sous vide egg bites. I used mason jars and their lids in the slow cooker. To the bottom of the slow cooker I added boiling water about 1/2 up the jars. I fit 8 mason jars in my slow cooker pretty easily. The first time I made them, I made one mistake, I didn’t set the lids on the mason jars. The first recipe I found said to place the ring in the bottom of the slow cooker and place the mason jars inside them, which I found totally unnecessary. 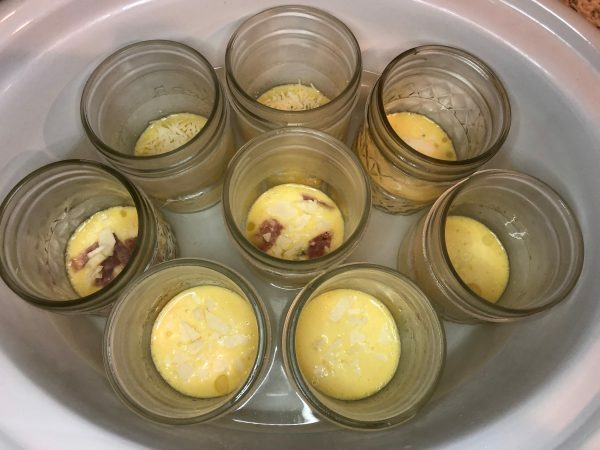 I have used a few different toppings in the slow cooker sous vide egg bites. I started with cheese, salami and chives, which turned out pretty tasty. But, the next time (when they turned out absolutely DELICIOUS), I used cooked bacon cut into small pieces and cheese and they were TO DIE FOR!! To the mixture, I added 1 cup of cottage cheese & 1/2 cup heavy cream (which is optional), I have made them without the heavy cream and they were still good. 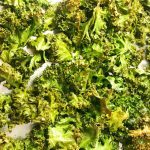 These are my kiddos favorite grab and go breakfast, you can make them with your choice of nut butter (I like peanut butter, but one of my kids likes almond butter and once I used cashew butter and they were AMAZING). They are grain free and gluten free too, oh and did I mention, they keep you full for a long time!? 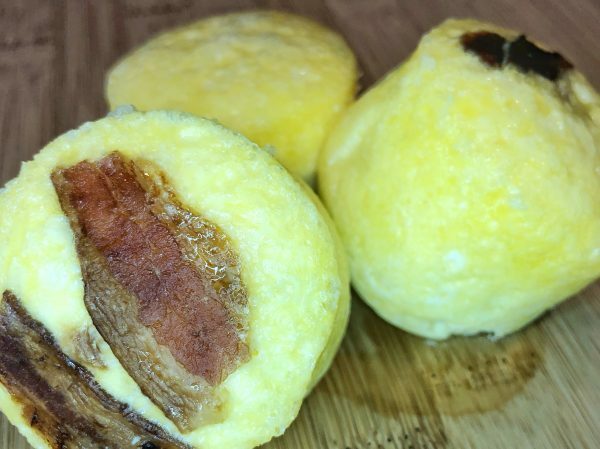 Sous Vide Egg Bites Recipe, these are the best easy slow cooker sous vide egg bites, EVER!! Mix eggs, cottage cheese and heavy cream. Spray 8 small mason jars with cooking spray. 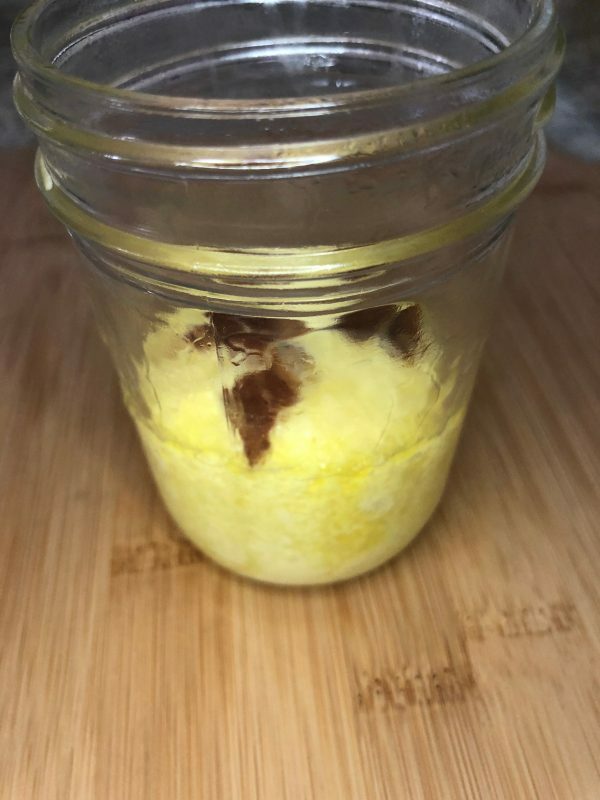 Add egg mixture to the mason jars, top with toppings of your choice. Add 3-4 cups boiling water to bottom of slow cooker. Add mason jars to slow cooker. Top jars with the lids (not the ring, but just the lids set on top). It keeps moisture in creating the creamy egg texture.